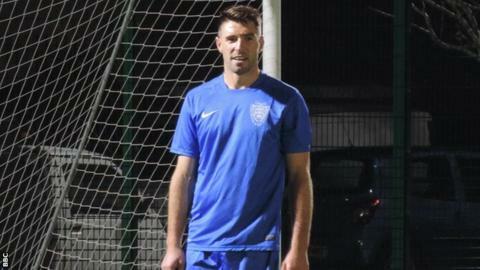 Jersey Football Combination are out of the FA Inter-League Cup following a 1-0 extra-time defeat by the Essex and Suffolk Border League at Springfield. Matt Warren's goal sent his side through to the quarter-finals after the hosts had missed a series of golden chances in normal time. Strikers Rupert Murray and Craig Russell both squandered opportunities for the former tournament winners. But Warren's shot deceived everyone and found the corner of the net. "It's quite sickening, I don't think I've ever seen a game quite like it," Jersey Combination manager Dave Kennedy told BBC Radio Jersey. "Clearly the weather spoiled what could have been a good game and throughout the 120 minutes I don't think either side actually mastered the conditions. "It's very difficult when your goalkeeper hasn't had a save to make all through the game, and we've hit the bar twice, we've had one cleared off the line and Rupert Murray's had an open goal. "Their goalkeeper's had some fabulous saves, unfortunately it's one of the those days." Jersey, who won the tournament in 2012 and went on to represent England in the Uefa Regions' Cup, had a chance scrambled off the line and hit the bar in the first half. After the break, Russell went closest to breaking the deadlock but dragged his effort wide as it finished 0-0 in normal time in terrible conditions. The strong wind and rain made it difficult for both sides, but substitute Murray could not use that as an excuse as he headed over the bar unmarked from inside the six yard box. The home side were made to pay for their misses early in the second half of extra-time when Warren picked up the ball from a short corner and his right-footed effort caught out the defence and goalkeeper Euan Van der Vliet. "I think we were the better side but the fact is that we're out of the competition," added Kennedy. "The reason for that is that we weren't good enough and there were far too many players below par."